The M.V. 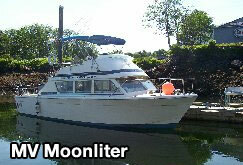 Moonliter is a spacious Fully Equipped 33' Fiberglass Chris Craft Cruiser.This fully licensed, Canadian Coast Guard approved vessel, boasts many amenities from home, including washroom, sleeping, and cooking facilities. It has top notch electronic gear including a Furuno Radar and GPS (Global Positioning System), VHF, and plotter on board. The M.V. Moonliter is powered by twin 350 V8 and cruises at a comfortable speed of 12 knots. The boat is 12.5' wide, wide enough for four people to comfortably fish across thestern, and is equipped with 4 rods and 4 electric downriggers. The M.V. 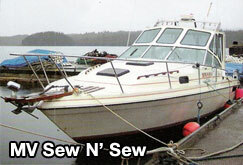 Sew N' Sew is a 30' Bayliner Cruiser. This boat is just a little smaller than our other craft, but is also fully equiped and Coast Guard Approved. Our vessels are always ready to go! So whatever adventure you choose you can be assured of a comfortable trip aboard either of our vessels.